Experience the World Cup at the heart of the action! 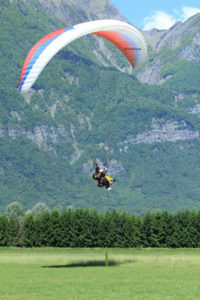 For the Paragliding World Cup, book your tandem flight at 50 €. Choose your day and your schedule, you will receive, after payment, your booking ticket to be presented at the reception on the basis of life. The schedule can be changed the same day depending on the weather conditions. Find all the terms and conditions on your ticket. Please let us know your mobile number and your weight later. Enjoy with family or friends the World Cup evenings. The Gabelin Farm invites you to participate on Saturday 20 May and Wednesday 24 May in two meals to fully enjoy the World Cup. These evenings will be lively (fireworks and concerts on Saturday 20 May and concerts on Wednesday 24 May). For paragliding enthusiasts, shuttles are available to take you to the take-off sites of Cœur de Savoie! (Montendry). Choose the formula that suits you best, either the "pass 10 montées" non-nominative at 50 €, the "unlimited passes" at 50 € or the "accompanying pass" at 100 € with the unlimited shuttle, lunch meals and festive evenings. These passes are only valid during the week of May 20th to 27th 2017 during the Paragliding World Cup. You will receive your tickets, after payment on line, by email, thank you to print it and to present it to the reception of the base of life.